As you might expect from an organization called Positive Coaching Alliance: coachability is critical. Nobody is infallible, but coaches usually get to be coaches by demonstrating knowledge of the sport and an ability to communicate in ways that get the most out of players’ ability. Players can learn a great deal about basketball and life from most coaches. The idea that you give respect to get respect is a two-way street between coaches and players. Once all are on that same street, coachability becomes natural. 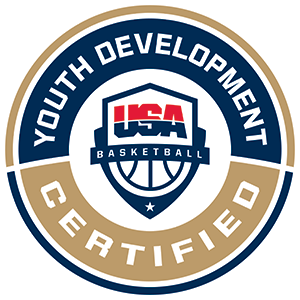 Even if players do not always understand a coach’s direction, one of the great values of basketball is the chance to try new things, learn what works and what doesn’t and apply lessons from that experience to future dealings with authority figures from parents to teachers to bosses. All the players will have 2 balls or share with a partner and spread out on the baseline. The players will get in a good stance and work on pounding two balls at the same time. The coach should stand out at the free throw line and encourage the players to work hard. If the coach holds up the left or the right hand, the players will quickly jab the corresponding foot out to the side and bring it back underneath them quickly. The coach will continue to hold up different hands and encourage the players to react quickly and jab to each one. Do this for the allotted amount. The coach should stay out in front of the players by starting at the free throw line and encourage the players to work hard. The players will alternate dribbling both balls in a good stance. If the coach holds up the left or the right hand, the players will take one big explosive step forward with that foot as the first step. 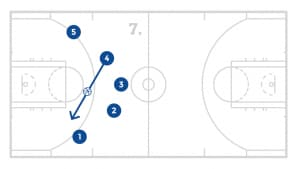 The players will continue to dribble 2 balls while reacting to coach and exploding forward. 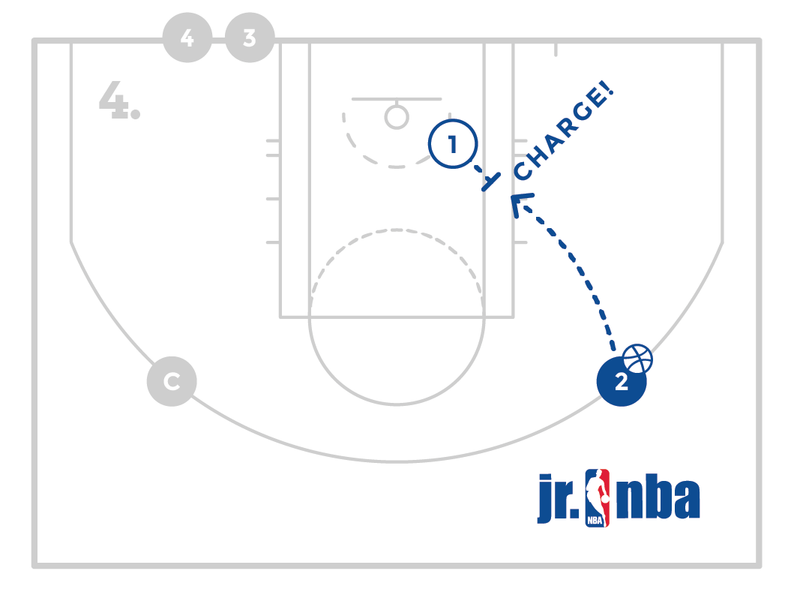 After the players get to half court, have them turn and come back as well until the allotted time has elapsed. Have one line on the wing with a ball and another line on the other wing. 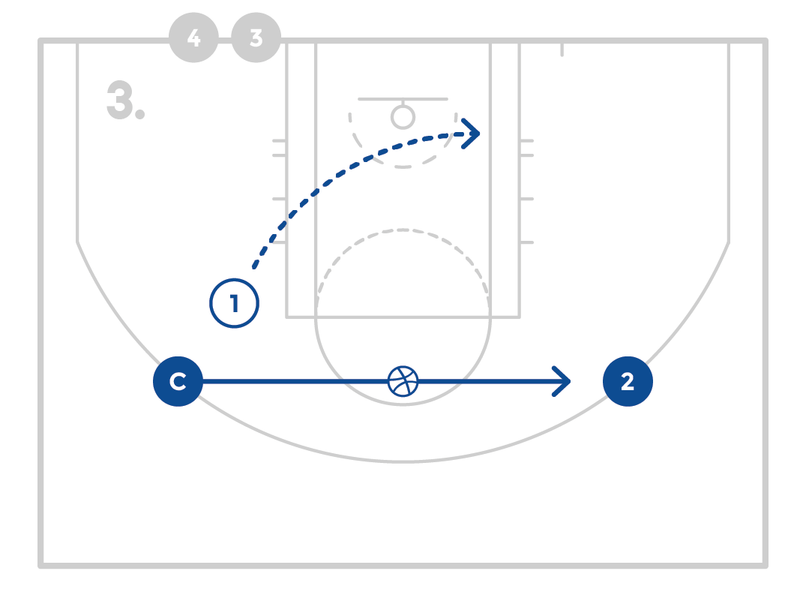 Have the line with the ball drive towards the basket on the baseline side. 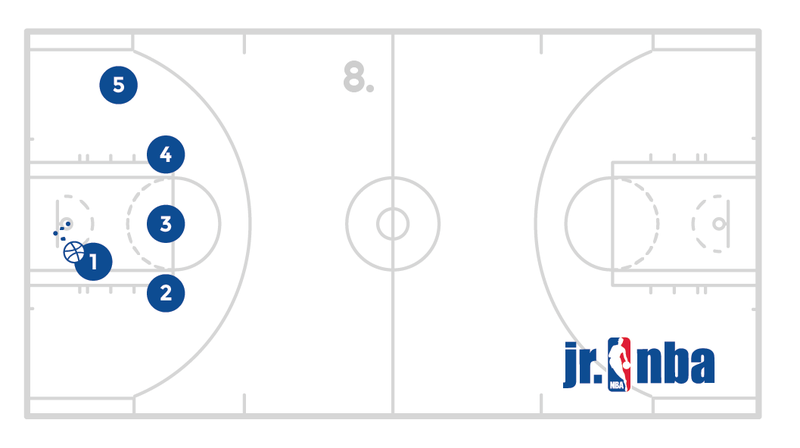 As the player drives, the player on the other wing will be dropping to fill the corner. As the player gets close to the basket, they will pass the ball to their teammate in the corner to catch and shoot. The next players in line will continue until the team has made the allotted number of shots and will then do the same thing the other way. Make sure the players dribbling into paint with the thought of scoring. Players should make a good pass to the player who is ready to catch the pass with their hands up and knees bent ready to shoot. All the players need a ball and can start on the baseline along the lane line. Utilize the other side of the lane or other lines to maximize reps. The player will pass the ball to the coach at the top and flash to the same side elbow. 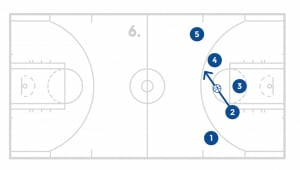 The player will complete the move at which time the next player will pass to the coach and the process will continue until each player has gone 5 times. Each of the 5 times, the players will use a different move. Then the players will also work from the other elbow. 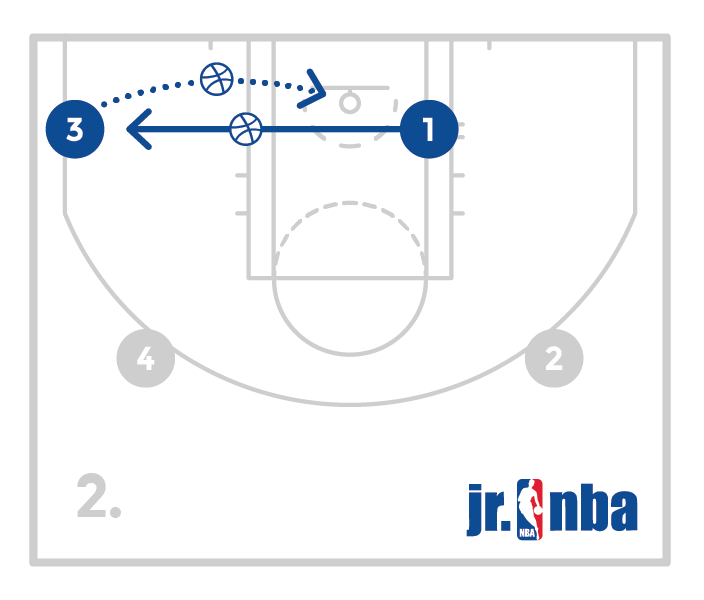 Turn and rip to the baseline with 1 dribble and a quick spin back to the middle and finish with no more dribbles. Next turn and rip to the baseline and take 2 hard dribbles and a big spin back to the middle and finish with no more dribbles. 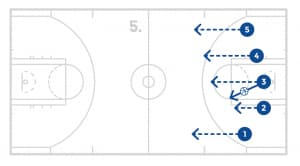 Next the players will turn and rip to the baseline and take 2 hard dribbles then make a half spin towards the middle before turning back to the baseline for a shot. 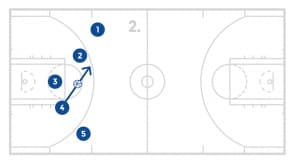 On the next catch at the elbow the players will simulate a defender playing them as they face away from the basket and the offensive player will give a quick spin off the defender for the shot of their choice. 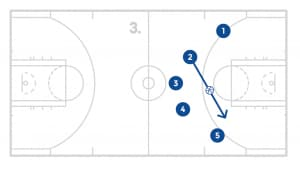 For the last catch, the players will take a dribble with their back to the basket and after the dribble, give a quick spin off to the shot of their choice. Have the players work on a variety of spin moves to finishes. 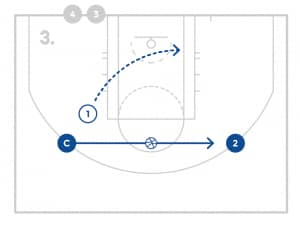 The first three will spins will be off of turning and facing the basket and the last two will be from starting with the back to the basket. 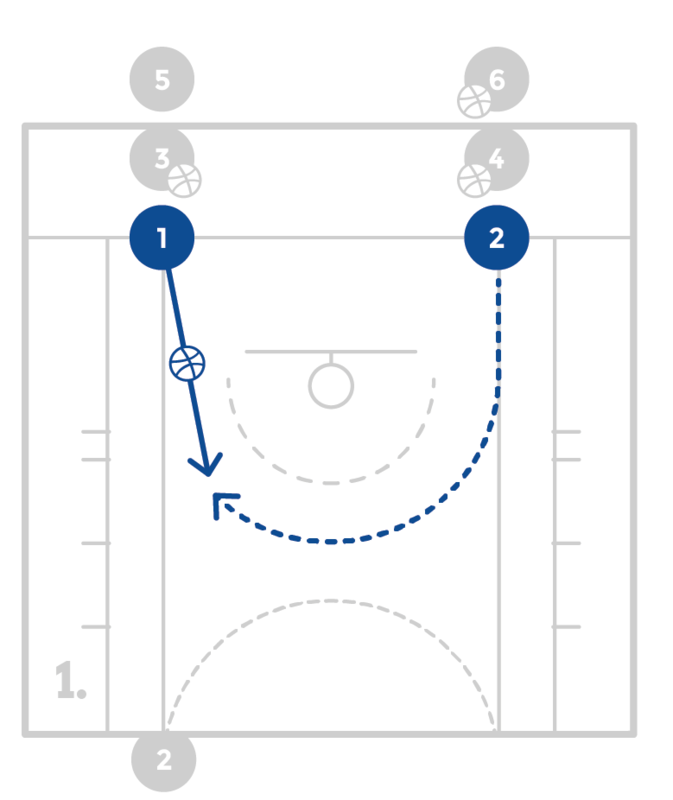 The guard will come off the screen and make a pocket pass to the big. 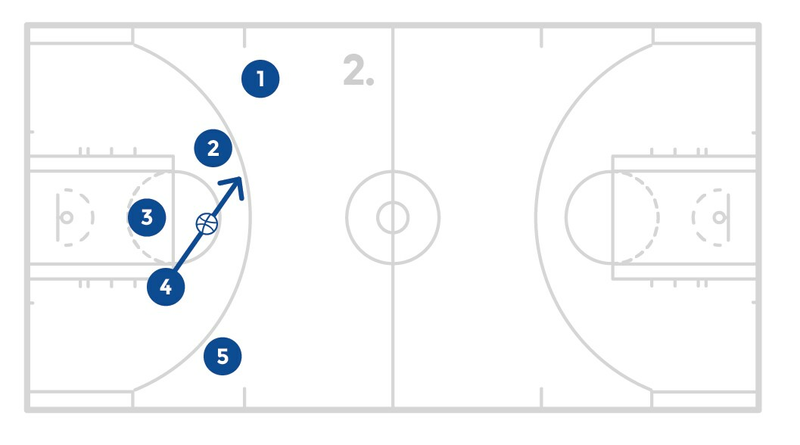 The post player will catch and finish in the paint and get their rebound and go to the back of the post line. 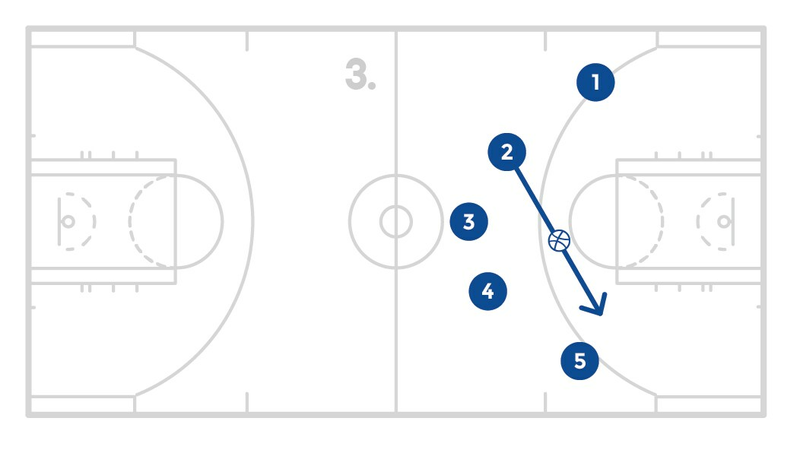 The guard will then relocate to a spot dictated by coach, catch a pass from coach, and take a shot dictated by coach. 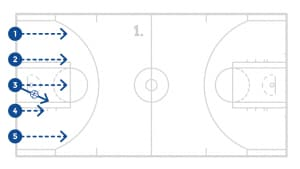 Have the players start in 5 lines on the baseline, 1 in the middle, 2 to the sides of the middle line and 2 out wide on each side. The first two players in the middle line will need a ball. All the players will run forward towards the other basket. The player in the middle will pass the ball to the player closest to them on the right, that player will pass the ball to the player to the left of the middle line, and that player will pass the ball to the player running out wide to the right. That player will lay the ball in and swing through to switch sides with player that was running the left wing. 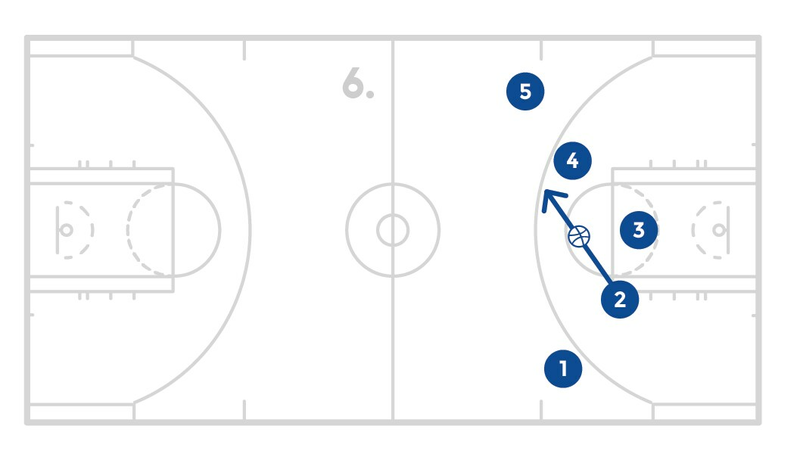 The player in the middle is responsible for getting the rebound without it bouncing while the players that were closest to the middle line will switch sides inside the paint. The players will immediately do the same thing on the way back to the original side. After they finish on the side they started on, they will step off the court and the next grow will start. 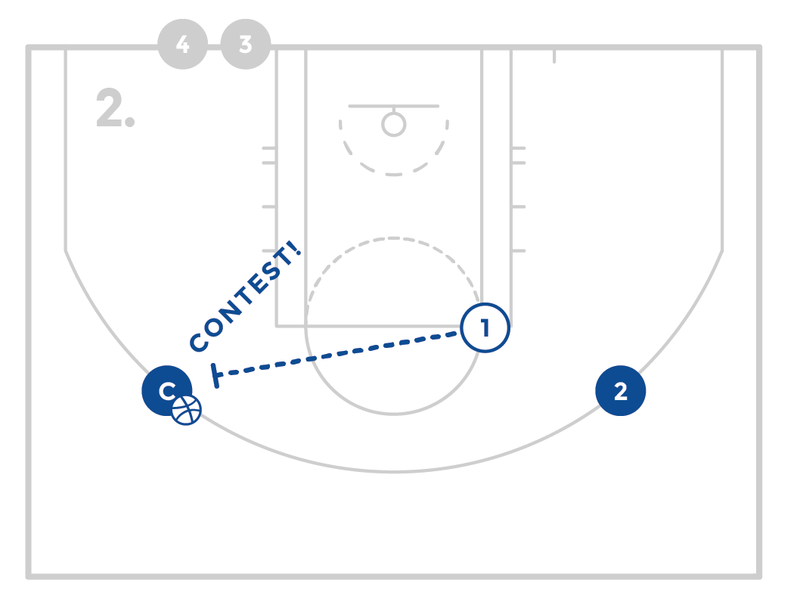 Each player should rotate through each of the starting points. Encourage the players to run hard and call names as the players off the court encourage the group. 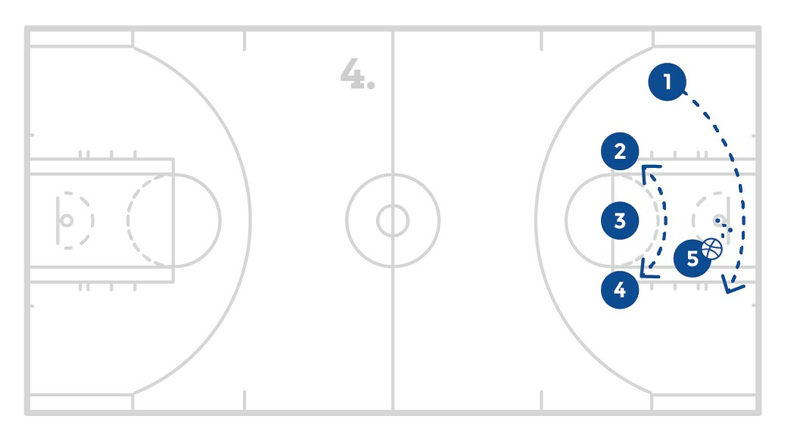 The coach will label the lines 1 through 5 on the baseline so that everybody knows which line is each number. The first group up will give the coach a ball and prepare for the drill. The coach will pass the ball to 1 of the players and call out 2 or 3 numbers. The 2 or 3 players numbers that were called will run down the court identifying where the ball is and where their teammates are so they can balance the floor. The player that catches the ball will dribble down the court and will help the players balance the floor. This player can also pass the ball. 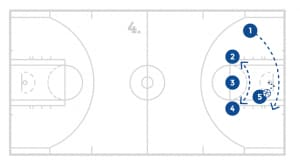 The players will balance the floor quickly and either take a quick shot or work on driving and kicking for a shot based on coaches decision. Help the players see and understand how and why balance the floor. Remember the player who receives the ball can also pass the ball to help the team get balanced. 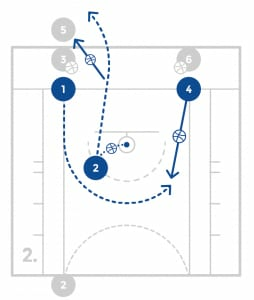 The players will start on the block in a stance chopping their feet with a line of players behind them on the baseline. Coach will roll the first ball out so the player must run and dive on it as a lose ball. 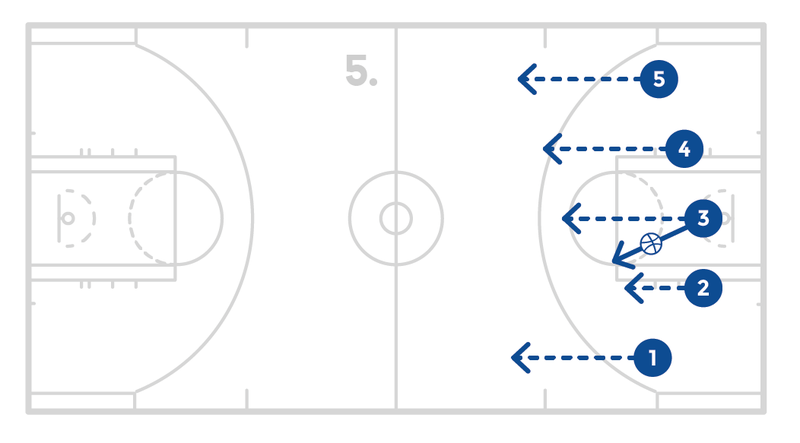 The player will quickly get up and close out on the coach at the 3 point line. 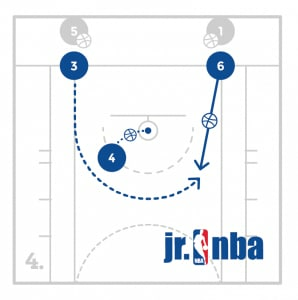 The coach will then pass to a player on the opposite wing and the defender will jump into help. 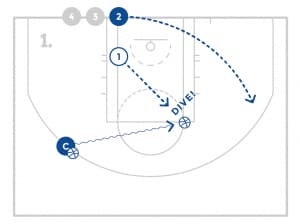 The player will drive to the basket and the defensive player must step over and take a charge completing the dive, contest and charge. The player who to the charge will move to the wing where they will be the driver. 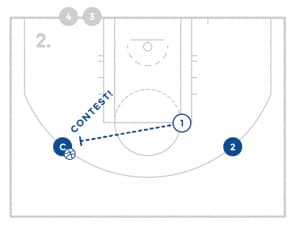 The driver will go to the back of the line on the baseline and the next player in line will step on the court and get in a stance to start the process of dive, contest, and charge. 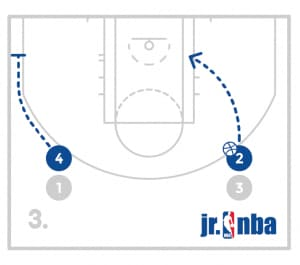 Bring a lot of energy to this drill! 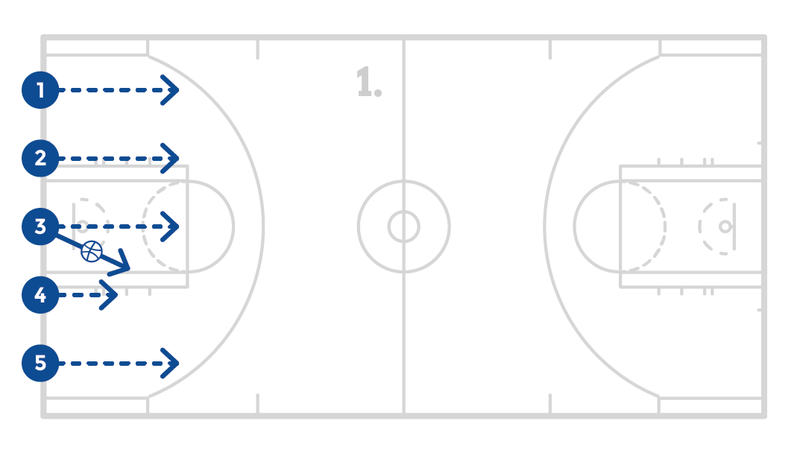 The players must start with a down screen. After that, the ball is live and the players can move and play as they choose. The players must start with a pick and roll. 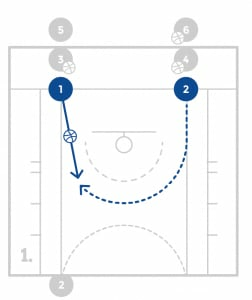 The players must start with a screen the screener which means the coach will start with the ball on the wing while a guard on the ball side block screens across the lane for a post player to come to the ball side, then a player around the free throw line area will set a screen for the guard coming off to the top. The players must start with a pass to the elbow from a guard at the top, there should also be a guard on the same side wing which will allow the guards multiple cuts and screens to work together on that side of the court.